Renowned manufacturers of HSS Piercing Punches, Ejector Pins, Molding Tools that are fabricated from high grade metal & alloys. Our hard-wearing products are at par with International standard to meet diverse industrial requirements. Our Dies, Die-Casting and Molding Tools and Components are fabricated form high grade steel, iron and other ferrous and non-ferrous material. These sturdy and corrosion resistant tools and accessories are available in diverse tolerances, tempers and other technical and dimensional specifications. All our tools and accessories can be manufactured as per the drawings and technical specifications provided by our clients. Based on our extensive R&D we are determined to put forth an all-inclusive range of accessories to meet the requirements of mould makers and die makers. 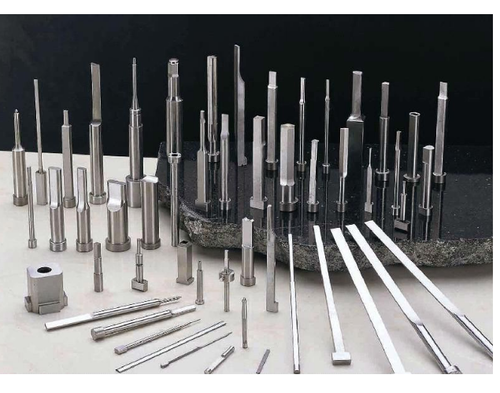 Our product range includes Mould Base Die Set, Mould Date Indicator, Parting Locks, Tunnel Gate Inserts, Aluminium Ball Cage, Brass Ball Cage, Sprue Bush, Runner Bushes, Square Ejector pins, Custom Ejector Pins, HSS Piercing Punches, Square Punch, Double Step Punch, Die Springs, Spring Plunger, Carbide Punches, Guide Pin, Guide Bushing, Spring Dowel Pins, Blade Ejectors, Ejector Sleeve. We are looking for export enquiries.